A pair of scenes of Paris: the first, by Tiela, shows the Vendôme Column, Paris. 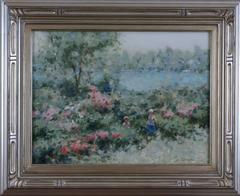 Oil on canvas measures 20 x 24; frame dimensions, are 24 3/4 x 28 3/4 x 1 7/8. Artist's signature, lower left. Weight is 6 1/2 pounds. The second painting, illegibly signed, is of a Parisian boulevard with colorful flower stalls. Oil on canvas measures 20 x 24; frame dimensions measure 24 3/4 x 28 3/4 x 1 7/8. Weight is 6 3/4 pounds. The paintings have been recently cleaned and varnished by a professional art restorer. Several touches of inpainting to address former frame rubbing. Very good condition. This piece is not framed. Yves Calméjane is a French artist, mostly influenced by Auguste Chabaud and Jean Arène.